For those who don't watch, "Rick and Morty," the whole weird memeification of an old McDonald's sauce flavor known as Szechuan Sauce probably seems perplexing. 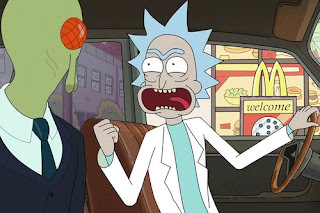 Basically, the season three premiere of the show discussed how the sauce existed for a limited time in 1998 as a, "Mulan," tie-in and made a joke out of how Rick is so out-of-touch with normal human emotions he'd rather focus on something as trivial as an old pop-culture footnote and his desire to eat more of it than develop meaningful relationships. It was a dark little joke, and because half of the, "Rick and Morty," fanbase is full of toxic jerks (the other half are perfectly nice people), a joke completely missed by that demographic of assholes who suddenly had to get that sauce. A throwaway bit became a running gag among the fanbase and anyone with an old packet of Szechuan Sauce could make serious bank selling it on eBay. Cut to McDonald's wanting to get in on the joke and bringing it back for just one day last year and the resulting mayhem that caused, and thankfully the company re-releasing the sauce again for real now in massive quantities so everyone can get some. As the only McDonald's sauce I really like is the Sweet and Sour option I would surely be unimpressed with this overhyped sauce, right? Well, last weekend my Father was kind enough to buy me a big box of nuggets on his way over to our house (my family was in town visiting) and the McDonald's he stopped at had some of the once sought-after Szechuan Sauce that they were happy to throw a bunch of packets in with my order--apparently I'm lucky as some locations don't have the stuff. I tried the sauce and...it's actually quite good. Who woulda thunk-it? "I want that sauce, and fans who miss the point of the joke will too!" 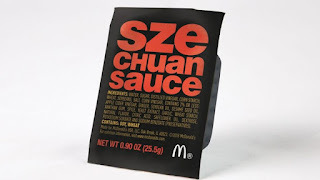 Szechuan Sauce kinds of tastes like Soy Sauce with a bit more vinegar and ginger thrown in, plus lots of thick sugars to give it a nice sticky texture that attaches well to chicken nuggets. It isn't the best sauce I've ever tasted, but it balances out its salty-and-sweet just well enough I found myself quite impressed. This article gives it a solid, "B," grade and I agree with that piece almost completely except where it says Szechuan Sauce is better than the McDonald's Sweet and Sour, that's a step too far! I'm genuinely surprised I liked the sauce as much as I did and I actually feel a little sad it may just be back for a limited time as it tasted quite good. I guess even if a lot of people ended up missing the point of the joke about Szechuan Sauce on, "Rick and Morty," it worked out for the best as the sauce is actually tasty. I'd encourage anyone who enjoys dipping their nuggets in sauces to give it a try, regardless of their feelings about the television show that helped get it brought back. Now, if only I could convince Baskin Robbins to bring back that ice cream flavor that tied-in with the old, "The Mask," movie I ate decades ago and loved.